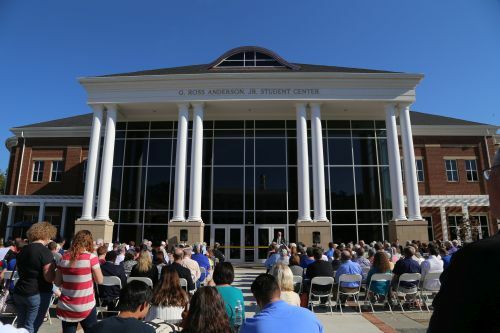 ANDERSON, SC (courtesy of andersonauniversity.edu) – Anderson University officially opened the 90,000-square-foot, $26 million G. Ross Anderson Jr. Student Center during homecoming festivities Saturday, Oct. 29. The student center has been open to students since August, but the ceremony was slated for homecoming at so more alumni and donors could attend. Several hundred people took advantage of a perfect fall day to enjoy the comments of university officials, current and former students as well as a dedicatory prayer. Students rave about the state-of-the-art facility, which includes a large dining commons, retail food outlets for Chick-fil-A and Einstein’s Bagels, a high-tech fitness center, a new bookstore, a recreation area, offices and a 400-seat movie theater.